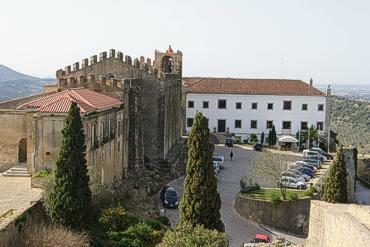 The Pousada de Palmela - Castelo de Palmela, nestles within the village castle, with the convent cloisters incorporated. Located on top of an imposing hill, it affords one of the most impressive panoramic views in the area. Palmela boasts excellent wines and superb cuisine, and it is also the perfect starting place to discover the Costa Azul and the magnificent Arrábida Natural Park. 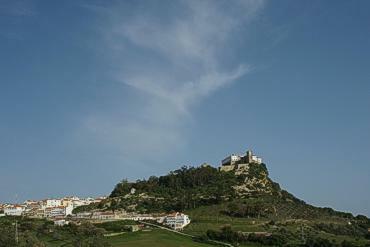 The Palmela Castle doesn't reveal any important architectural references, neither has it any legends. However it is mentioned by the Portuguese writer Luís de Camões in his book Os Lusíadas, which emphasises D. Afonso Henriques deed, who with only sixty worriers re conquered the castle. Within its walls was born one of the most important pioneers of the "Portuguese Africa", Brito Capelo. 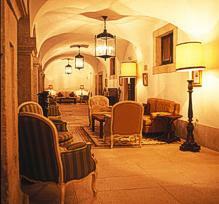 In the castle also lived other significant people of Portugal's history, like Nuno Alvares e D. João II. In its churches lie other famous names notable for their weapons or words. After the extinction of the Orders, in 1834, though the castle a ruin it was classified as a National Monument on the 16th June 1919 and was reconstructed. 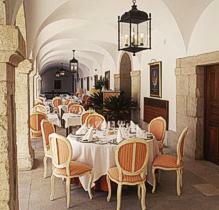 The Pousada Castelo de Palmela is a 500 years old Convent. In 1940 took place the partial restoration of the Castle and in 1979 the Pousada was inaugurated, after the adaptation works to the Convent. 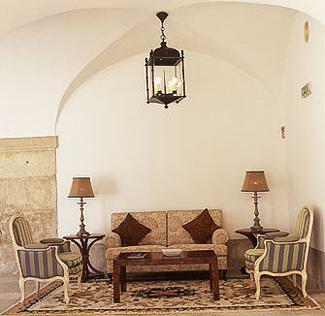 With all its austerity, it is possible to enjoy its interior in a comfortable way that preserves a lot of the 17th century. 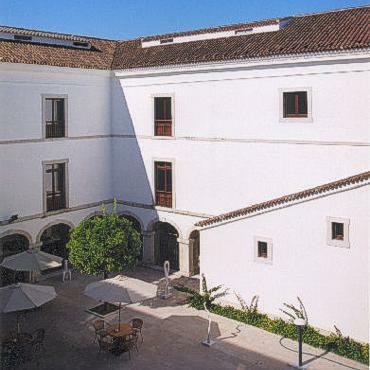 Through the cloister is the entrance to the galleries, the social space of the Pousada. The Santa Maria church, inside the Castle Walls, is very old and was a ruin for many years. But, in 1534 it was rebuilt with charity help of Dom Prior and many volunteers. Though it was destroyed by the 1755 earthquake, it still preserves the Renaissance edification. The Palmela village was founded 310 before Christ. Palmela seems to be the short name of "palma", a Latin word that means palm tree leaf or victory. 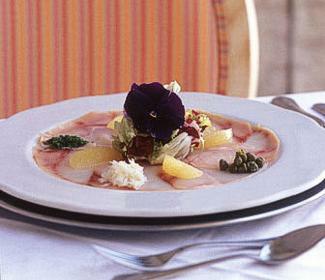 "Palma" expresses also a woman name and "palme", a male name. However, little is known about Palmelas history before the conquer of Lisbon by D. Afonso Henriques. It was then abandoned by the Arabs and became in the Christians possession. Built in a privileged location, the Palmela Castle is a key point between the Sado and Tejos basin and was one pf the parts of the defensive triangle of Lisbon. The castle was reconstructed by D. Afonso Henriques, D. Sancho I and D. Afonso II and amplified by D. João I still in the 17th century. There aren't many military histories about the Castle in the following centuries, neither during the Restoration wars, nor even afterwards. Nevertheless, in the end of the 17th century were built the castle walls. The castle also had a high tower, bulwarks, the governor house and soldiers quarters, where they would stay in any war occasion. It is one of the best architectural fortresses, specially known for its location and the magnificent view that it has to offer. 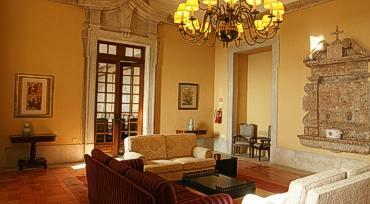 The Pousada has 23 double rooms and 5 Suites (2 with sea view, 1 with the city view, 1 with the castle view and 1 King size). 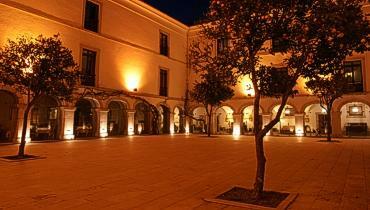 There is the possibility of organizing exclusive weddings in the Pousada. The wine growing region of Palmela is near Setúbal, 40 km south of Lisbon.